Quinoa is very popular around here! We use this pseudograin in stir-fries, salads, soups, and much more… including baking! It’s not actually a grain but what’s considered a pseudograin, since it’s not actually a grass but its seeds can be ground into flour, like wheat. 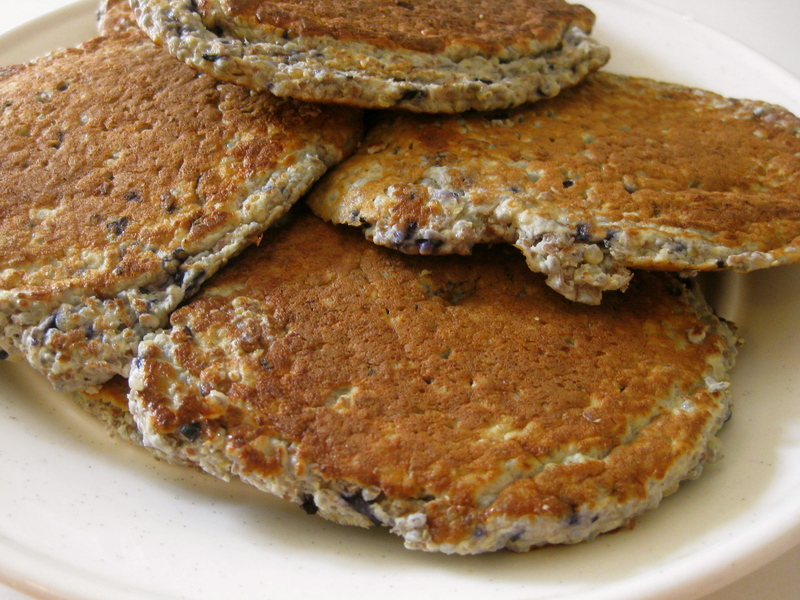 When we cook quinoa for dinner, I like to make “planned-overs” so I have some extra for healthy pancakes that I can snack on throughout the week. Pancakes are easy, fast, and super-duper versatile. 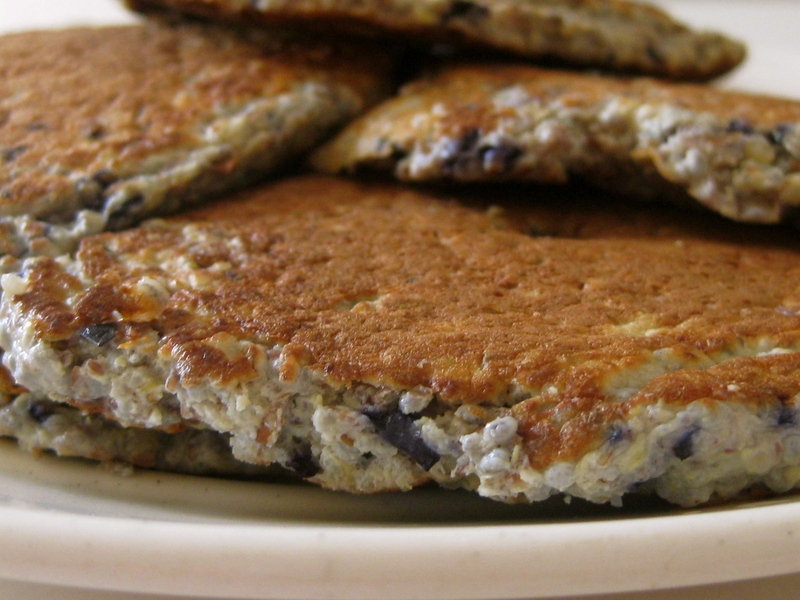 You can pretty much make a pancake out of anything. I like to make mine high-protein so they’re a good post-running snack. I’ll make a batch of 12 or so, then pop one in the toaster oven to reheat whenever I want a healthy, protein- and fiber-filled treat. I usually start with a foundation of a grain or pseudograin, such as cooked quinoa, brown rice, or millet. If I don’t have any leftover cooked grains, I’ll use a blend of (usually gluten-free) flours. Good ones to try are garbanzo flour, brown rice flour, coconut flour, and amaranth flour. Then I add eggs ~ although you can use egg replacer to make them vegan! If you eat dairy, you can add some cottage cheese, too. Then I add some protein powder, either Vega One or hemp or brown rice protein powder. I add some chia seeds and/or flaxseed meal. Then I add whatever fruit I have lying around: usually blueberries, but sometimes apples or bananas. I blend it all up, adding water, coconut milk, or rice milk as needed to get the right consistency. Then cook ’em up in a little oil and chow down! 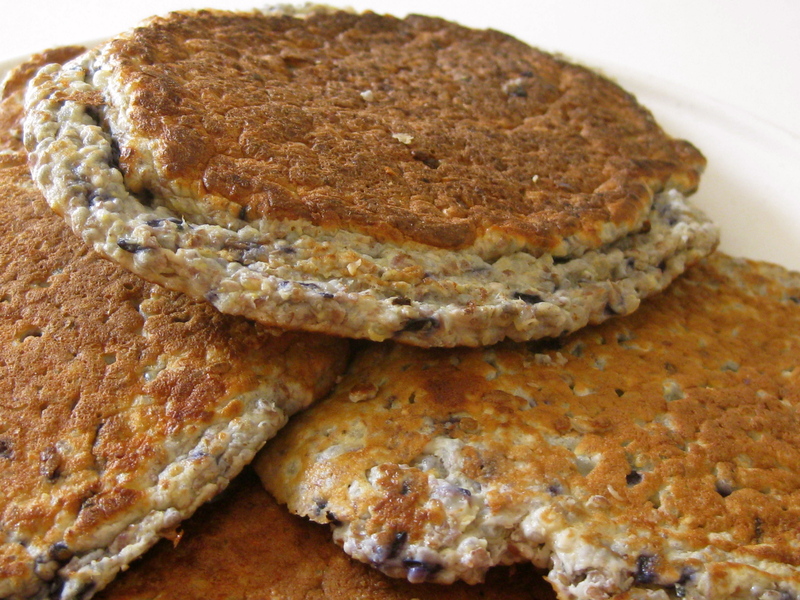 This recipe is for 12 of the the pancakes pictured here, but it’s easy to get creative! Make whatever substitutions you need or want, and enjoy! Blend all ingredients until smooth, adding water or rice milk, as needed. Add a Tbsp. of coconut oil. Pour the batter into the skillet, forming 4-6 pancake rounds. When the edges of the pancakes start to turn brown, flip them with a spatula and cook for the same amount of time on the other side. Allow to cool slightly before eating. Serve with butter, Earth Balance, nut butter, maple syrup, or the topping of your choice. Enjoy! What’s your favorite grain or pseudograin? Sounds healthy and delicious! I have all these ingredients on hand so I think I know what I want for breakfast! My favorite quinoa recipe is one I’ve made with sweet potatoes! It’s a great side dish or even dessert! It’s in my recipe section- if you this grain, you’d love this recipe! Yummy! Have a wonderful day! Yum. I’ve still never tried quinoa – I must make myself! You know, as adventurous eaters as we are, we have only ever eaten white quinoa! I’m eager to try red and black, though. In Chinese medicine, black foods are cooling, which is not enticing when it’s 49 degrees and raining, so maybe I’ll wait until it’s actually Spring around here, haha! 🙂 Have a great weekend and enjoy the pancakes if you make ’em! Oh, YUM! Will be trying these!! Great for my tiddler too!